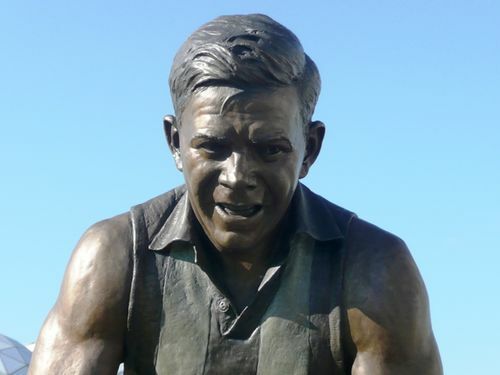 A statue commemorates Australian Rules footballer Lou Richards (1923 -2017) who was one of the true legends of the Collingwood Football Club. Lou played 250 games for Collingwood in the Victorian Football League (VFL) between 1941 and 1955. After he retired from playing football, he had a long career in the media, beginning as a sport journalist for The Argus and The Sun News-Pictorial. He was a very popular commentator on both radio and television. Lou Richards was a champion of the Collingwood Football Club. A tough and courageous player, a great team man and an inspirating Captain who led the Magpies to the 1953 VFL Premiership. A star on the field, Lou was a superstar off it. As a media performer he was a trailblazer, spreading the popularity of football nationwide in a career that covered print, television and radio for more than fifty years. Lou Richards` magnificent contribution to Collingwood and Australian football has made him one of the most revered figures in the history of the game,.